1991 was an exciting and successful season highlighted by two gold medals and seven finalists. It was the largest Australian rowing team to race in Europe with 74 members. Further, two crews raced at the Lucerne Regatta with great success, three crews undertook altitude training at St Moritz and the men's four had a successful two month tour of Europe. 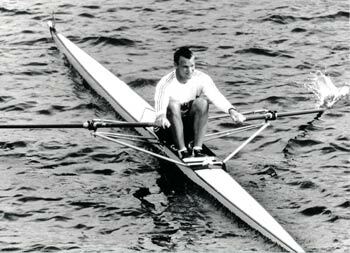 The men's four once again won at Lucerne and at the World Championships making them the hot favourite for the 1992 Olympic Games. The lightweight quad scull raced a heartstopping race rowing through the field to win by 0.23 seconds. Special mention must be made of Peter Antonie's fourth place in the single scull. For a person of his height and weight his result in the final was unbelievable particularly after one of the toughest semi final races ever seen. Peter was still very stiff and sore from the semi-final when the final was raced two days later. Also with a sensational semi final was the men's double scull which was won by Australia. Australia led the whole way but with 100m to go four crews were in a line before Austria stopped rowing to the horror of the home crowd. Australia went on to record a win in that race. In the final our crew led to the 1000m but was unable to withhold the opposition in the second half of the race. The Australian lightweight crews were very strong but it appeared that the standard had risen across the board internationally since 1990 as well. The altitude camp was undertaken under the stewardship of Thor Nilsen, the successful coach of Italian, Norwegian, Spanish and Irish crews. Alan Hahn from the AIS joined the tour as a consultant, continuing his work into physiological aspects of rowing performance. Much was learned from the altitude experience, though it was not repeated in 1992. Peter finished third in his heat and second in his repechage. In this author's opinion, his greatest race ever was in the semi-final where he qualified. He raced against far stronger and bigger opposition and had to row through them to get third place. However this race was to drain him completely and so his final result of fourth was sensational. The Australians finished second in their heat and won both their repechage and semi-final. The Semi was against the silver and bronze medallists and so the final result would have been a disappointment. The Australian crew had experimented with altitude training along with the men's double and single. The crew finished third in their heat, third in the repechage and fifth in the semi-final. The result was disappointing in a pre Olympic year. Another great win to the Abbagnale brothers. The Oarsome Foursome won despite being penalised a false start for a traffic infringement the day before. Another great result for Silken Laumann of Canada. The Australians finished third in both heat and repechage and therefore were relegated to the B final. The Australians disappointed in their repechage finishing last and being relegated to the B final. The Australian eight finished fourth in their heat and repechage and last in their B final. This was a great race and a great result for the Australians. The Australian crew finshed second in both their heat and semi-final.